William Hall and his all American band feature musicians that have worked with Michael Jackson. William takes on his persona and fills it with the magic that is Michael Jackson. His dance troupe recreates the Jackson experience featuring all the big hits from the Off The Wall years through to Thriller and Bad. The show is described as simply breathtaking, mesmerizing and incredible. The show features (Guitarist) Tommy Organ from Michael Jackson's 'This Is It” Tour. The show is musically directed by (Bassist) Sam Sims, long-time work affiliate to MJ studio and stage and world renowned Bassist. 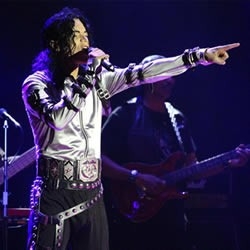 It is choreographed by LaVelle Smith Jr who featured in both the BAD and Dangerous Tours and engineered by the great Michael Prince, who was Michael’s personal engineer for over 15 years and also engineered on the “This Is It' tour and “This Is It” the movie. The show features three prestige background vocalists - Kevin Dorsey and Ken Stacey who both worked with MJ on the Bad Dangerous and This Is It tours and the beautiful Jade Claggett (Vocalist). This exceptional cast recreates the soul and passion of MJ's music - from the vocals, choreography, replica of costumes and so much more.... Michael Jackson - The Legacy Tour features all the King of Pop’s biggest hits - packed with authentic touches and flair. This is as close as it is ever going to be of experiencing a Michael Jackson concert!